Welcome to HarborChase of Naples, and the highest standard of senior care communities offering assisted living and skilled nursing programs. Respect and simple kindness abound here as we celebrate each individual life with the dignity it has earned and a warm appreciation of chapters still to unfold. We know you're facing a difficult decision. That's why we're here, and why we do what we do. We understand the challenges you face when caring for a loved one that requires more assistance than you can provide on your own. But now imagine a new home where lovely surroundings, tasty food, and a compassionate, competent staff make each day shine. This is HarborChase of Naples, where we pride ourselves on setting the gold standard every day, in assisted living and skilled nursing communities. 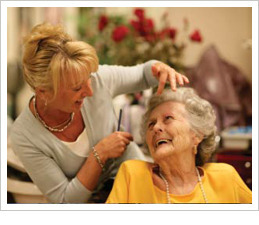 Come visit and experience our tradition of excellence in senior care. Call today; this could be your truest act of love.